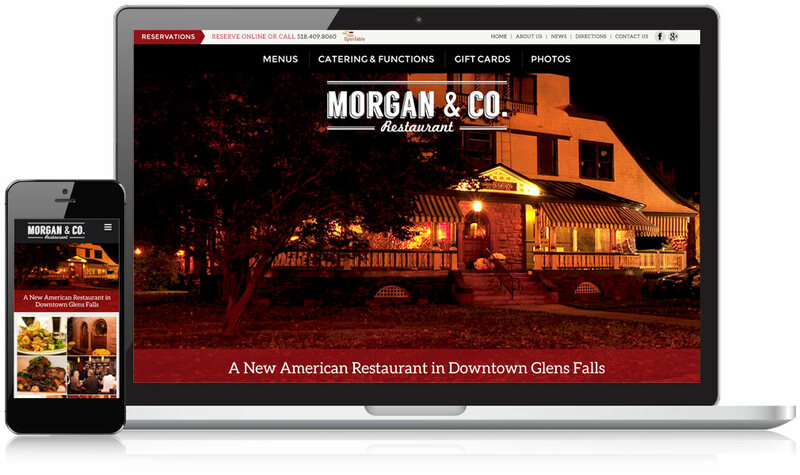 As Morgan & Co. prepared for the grand opening of their new gourmet restaurant in Glens Falls, NY, the new website needed to help convey the modern yet cosy warm atmosphere of their restaurant, promote their delectable dishes, encourage visitors to make a reservation. When visitors land on the new Morgan & Co. website they’re greeted with a professional full-width image of the restaurant. A classic black-and-white color scheme, coupled with interior photos of the restaurant, help reinforce the modern dining experience. A clean, user-friendly navigation which links to various sections of the website makes it easy for visitors to find their way to the information that serves their immediate needs. Mouthwatering photos are displayed prominently on the website to visually communicate the detail that goes into every dish, while strategic calls-to-action and readily available contact information encourage visitors to make a reservation, book a table, or buy gift cards. In addition, customer reviews are peppered throughout the site for an added measure of credibility.